We grabbed continental breakfast at the Quality Inn (it was good) and got their return “shuttle” (old maintenance dude in pickup truck) back to the trail. We didn’t get started until almost 11, so it was already sweltering when we started. Most of the day we ambled through the green canopy of Northern Virginia, so that at least kept the sun off of us. 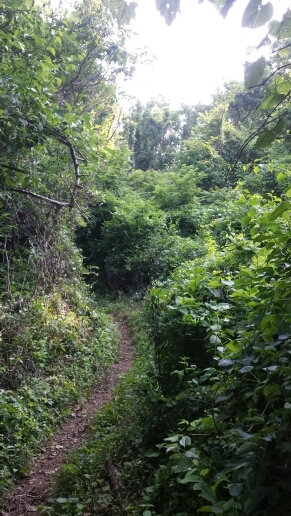 Some of the trail went through forests with some really cool tall soaring trees and some went through overgrown weed areas. I think this is kudzu that is taking over some areas? We surprisingly hit two trail magic offerings, which is not typical for a weekday. The first was a software engineer (nerd alert!) who just finished up a section hike and had a spare day and wanted to chat with some thrus. Seemed like a really nice guy. We started to talk about software engineer interview questions and it almost got really nerdy. He wants to thru-hike in a few years. I couldn’t relate to the weirdo. This was so awesome because it was perfect for the super hot day. The cooler was filled with Gatorade and fruit. The beach chairs were amazing. Whoever did this is my hero. It was hard to leave those comfy chairs behind. We figured we would camp maybe a couple miles from the magic chairs since it was 6pm when we hit it. However, we didn’t know this but we weren’t allowed to camp in the Sky Meadows Park that was right after this magic. So we trooped through the 3 miles of the AT in the park. When we got out of the park there was no flat ground to be had for miles. We ended up hiking until about 8:30 to find a spot near a nice stream. The day went later than planned for sure, but no biggie. The later hiking was much cooler. Tomorrow we have a last treat from Virginia. It’s called The Roller Coaster and it’s 13.5 miles of nearly continuous several hundred feet tall ascents and descents. Weeeeeeee amusements! I predict it will be extremely sweaty. I hiked most of the day sans shirt so that new super cool hipster trend may continue tomorrow. This entry was posted in updates on June 19, 2014 by Joel. It seems there may be a need for a study here…the link between software engineering and wanting to hike the AT!! Is there a brain connection (or perhaps a mis-connection) that causes this? 🙂 So glad you finally found a place to rest your weary bodies! Be sure to fasten your safety belt when you’re on the roller coaster. Be safe and healthy. Sending roller coaster thoughts, prayers and lots of love. Great job documenting all this stuff. I have been keeping up and cant wait for mile 1000! 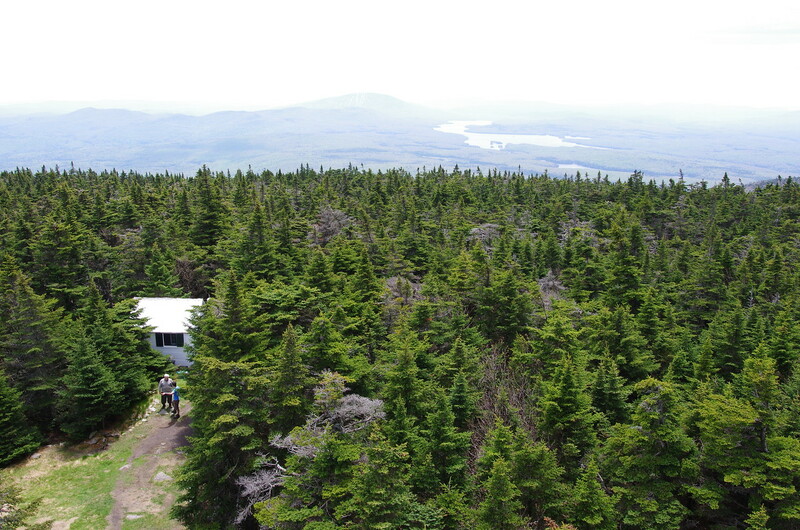 Btw – I did a 3 dayer along the AT in VT over memorial day and the small biting black flies were pretty bad. Got maybe 20 bites on my legs (but killed around 5 or 6 times as many…) so I would recommend long pants if you have them. Thanks Jake. Will keep an eye out for those flies in VT. Where did you do your 3 day section out of curiosity? Hey! 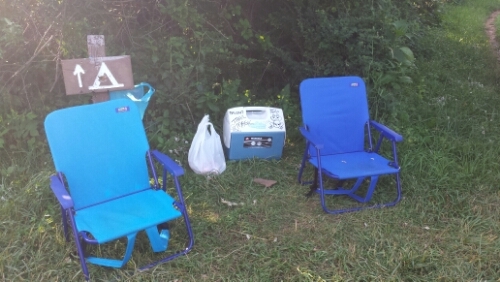 Those are my chairs and cooler near Sky Meadows! Glad you enjoyed them. How cool to see a pic of them here. Shellie – thank you so much for that trail magic! It’s so cool that you found our blog and saw your chairs. That was a great day that really sticks out in my memory. 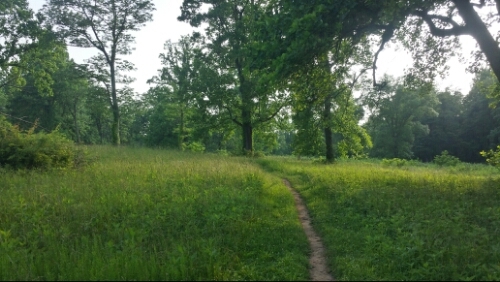 It was the random kindness of folks like you who really made thru-hiking the trail such a wonderful and unforgettable experience. Many thanks again.